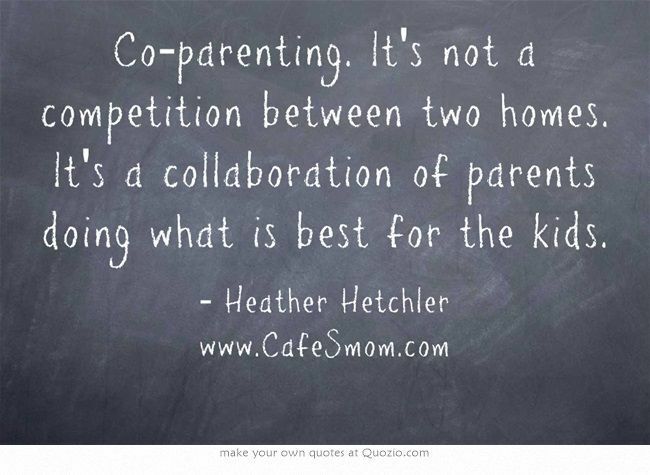 Co-parenting is more common in our society with the growth of blended families. Some parents are able to unite in parenting efforts with no major problems. Many others including myself for a spell found co-parenting challenging at times. High conflict custody battles can be emotionally draining for both parents. Constant disagreements and tension in conflict can be especially draining for children. Tension between two parents who refuse to get alone can also be costly in legal fees. Co-parenting in peace to the best of your abilities is essential for the betterment of the children who are the most important factor within the equation. It took years for my ex-husband and I to join in one accord to stop the unnecessary madness, drama, and battles with huge cost in legal fees. The strain had a strong impact on me emotionally and was physically draining. I honestly believe the back in forth had an impact on some of our son’s behavioral issues. You get to a point in stressful co-parenting of being tired of pointing the finger, bringing up the past, and the accusations. In co-parenting in peace it’s not about being the “bigger person” or being the martyr within the situation. It doesn’t matter if one parent comes to the conclusion a little late in the heated battle in working this thing out to live in harmony for the children. When trying to cooperate in cultivating a healthy blended family and parenting it’s all about the children. Remember to always keep the children 1st. It’s about their needs and not our own motives and objectives . Leave the past of the relationship in the past. It’s not about the two of you all’s romantic history. Only precautions to take in consideration of relationship history which are very important for your protection and the children’s are if domestic violence is involved in any capacity for which be sure to follow through with a protective court order. Do not not speak negatively about the other parent in the presence of the children. Although tempted when you feel you are being attacked hold still to your character. Children are much wiser than we think, if there is anything that needs to be recognized they usually figure it out in their own time. Advise your spouse, partner, relatives, and close friends who are caregivers to not speak negatively about the other parent or the details of your past relationship in front of the children as well. Be sure to share all information concerning the children to the other parent of report cards, medical issues, activities, and special programs. Regardless if the other parent attends the events or utilizes the information is on their part. Just do your part especially if you are the custodial parent. It will more than likely be documented within your court ordered. Do your best to communicate in tactfulness and with respect with one another. Slowly introduce the people you are dating to your children. Make sure it’s a serious relationship and not a fly by night romantic fling. Also, if the relationship is getting serious to the point of consideration of a future “step parent” be sure to formal introduce your partner to let the other parent know that they will be apart of the child’s life. Set clear boundaries in respecting each other’s personal life. Don’t get into the tug or war games of competition, bidding for the children’s acceptance through expensive gifts, or putting the children against the other parent. Do you best to handle conflict in peace,amicably, and in mutual agreement without constantly fighting in the court. Do your best to follow through with your financial responsibilities in providing for the children. It’s about the children’s needs in the matter. Stay cordial. You don’t have to be best friends, but it’s best for the children to see the two of you getting along. This is especially important for birthdays, holidays, and special occasions. I learned through much struggle, stress, and mistakes the benefits of taking these things into consideration. It really helped within my co-parenting situation. Our co-parenting situation has improved by showing respect for one another, letting go of the past, and more importantly keeping our son first. May you go forth in peace.